Reliable and Dependable Power on the Go! Color: BLACK 4 Ports each with 2.4 amps! Rapid Charge 4 Devices at the same time including 4 ipads! 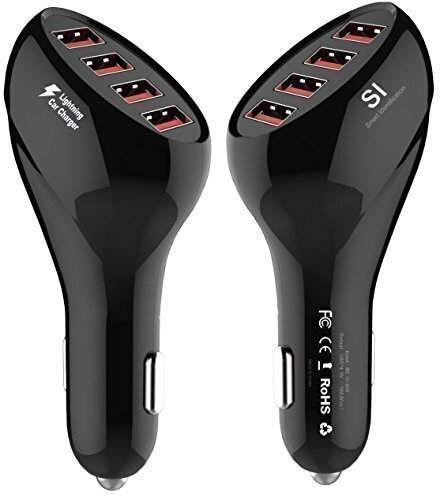 Just plug the 50Watt / 10 amp 4 port USB car charger into your vehicle's cigarette lightersocket and connect up to four USB devices in one go. Sleek Design The Lightning Car Charger is beautifully designed with smooth contours andbold black color to match every performance car interior. Quality Components and Construction The Lightning Car Charger features a sturdy, patented design; is made of top-grade plastic, circuitry; and uses cowling to keep temperatures low, ensuringstable working conditions, a long lifespan, and a low-temperature chargingenvironment. Safe and Reliable Advanced safety circuitry protections your valuable devices againstoverheating, over current, and overcharging. The charger is certified by RoHS,CE, and FCC Compatibility The Lightning Car Charger is suitable for a wide range of devices: iPhones,iPads, most smartphones, tablet PCs, mini speakers, MP3/MP4 players, GPSnavigation devices, handheld consoles, and other digital devices with 5Vinput. Quantity is 1 per order.